Back in the days when an Irish coffee cost just Bs. 3.50 (about 50 cents), a ham and cheese sandwich cost just Bs. 1.50 (about 30 cents), and a beer cost just Bs. 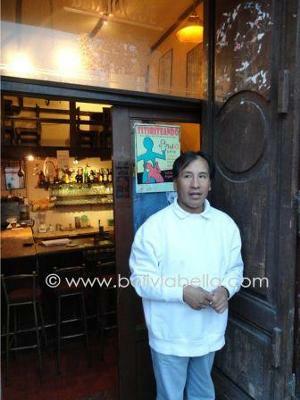 3.00 (about 45 cents), Bibliocafe was the first café bar to open in Sucre, Bolivia. 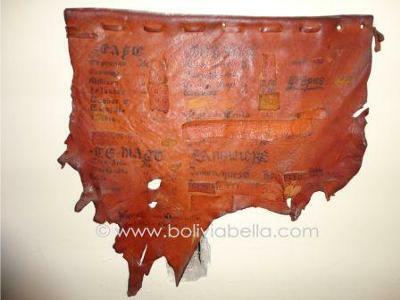 Or so we were told by the current manager as he showed us the remnants of one of this restaurant's first leather menus hung on a wall. We didn't actually get a chance to eat at Bibliocafe. We simply stopped in to speak to the manager, get updated information for you on what the restaurant currently serves, and take some photos to prove we were actually there. Bibliocafe is located directly across the street from Sucre's central plaza cathedral. The cafe offers a wide assortment of pastas, salads, and typical Bolivian dishes like "pastel de quinoa" and "pique a lo macho". You'll also find crepes, sandwiches, entrees, and desserts like fruit salad and fruit crepes. Bibliocafe has a full bar and four daily specials. 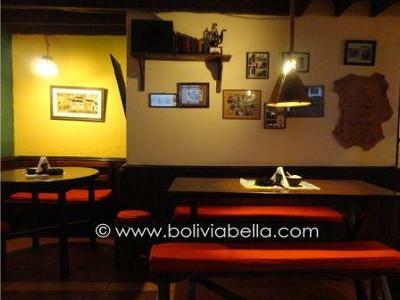 You should be forewarned that in Sucre, when a restaurant offers to tell you what's on "el menú" they are referring to the daily special which usually consists of a full meal, drink and dessert for a single price. The "menú" or daily specials are often posted near the door as you enter or are simply recited to you by the waiter, who will then probably tell you that you can also order "a la carta" (from the menu) which is what's actually on the printed menu. Today Bibliocafe (not to be confused with the Bibliocafe Concert restaurant next door) is fairly large and roomy with comfortable seating both downstairs and upstairs. The manager tells us it tends to get very full at dinner time when college students and tourists mix it up to dine and smoke a lot while lunch time might be a better option for families with kids. I love how he approached us as we walked in the door, cameras in hand. "You know," he said in a proud and somber tone, "you have just entered the oldest café in Sucre." Sucrenses, you see, take their history very seriously. If you pay close attention, you can learn a lot about the life and history of Bolivia's capital city. Take some time to talk to the locals. They can tell you many interesting anecdotes and can turn anything into a tour, even a restaurant.